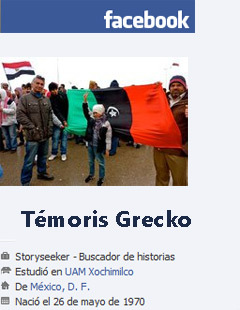 Témoris Grecko -Journalism page Este es un video de marzo que muestra la verdadera actitud de los generales que mandan en Egipto: agresiones, torturas y abusos sexuales contra muchachas. A pesar de la evidencia, rechazaron las acusaciones. Ahora, un general de alto nivel reconoció ante Amnistía Internacional que se habían realizado “exámenes de virginidad” en estas chicas y “defendió la práctica”. Témoris Grecko -Journalism page Enfrentados a estos terribles monstruos con jiyab, “no queríamos que dijeran que las habíamos atacado sexualmente o violado, así es que en primer lugar queríamos probar que ellas no eran vírgenes. Ninguna de ellas lo era”. Témoris Grecko -Journalism page Ocho chicas fueron forzadas con amenazas a someterse a “exámenes de virginidad”, realizados por un médico enfrente de soldados que hacían fotos con sus teléfonos móviles. De manera que, para evitar que las chicas dijeran que las habían atacado sexualmente… pues las atacaron sexualmente. Your intention is not understanding, just attacking. I have never ever ever said that any woman or person should keep their mouth shut for any greater good. That’s your invention, a plain lie. I originally asked Logan to speak out and clarify what had happened. Why? Because she and/or the CBS were misportraying the facts, and this had consequences in terms of bigotry. When she finally spoke, she sadly insisted on the misportrayal. Women and all victims have to speak out when they’re attacked. But if we are to fight the roots of violence with any efficacy, we have to make sure denounce is properly done: this is, accurately sticking to truth. Otherwise we have a cry wolf situation and this fight is weakened. I don’t have any particular bias in favour of Muslim women, as you suggest. But they spoke out in time and provided a believable account that, contrary to Logan’s case, could be researched, contrasted and proved. And now we have a senior general who admits they decided to assault them. The situation is completely different. I read your earlier account of the Lara Logan saga with great interest. Unlike so many other accounts of the incident, you provided named witnesses in addition to your own eye witness testimony. Also, unlike CBS and Lara Logan, you have been willing to answer follow-up questions. For all of that, you have certainly gained my respect. I noticed, though, that you didn’t mention your specific location in Tahrir Square when you saw Logan (a tea vendor could be anywhere), nor did you say what time it was. Those would both be very useful facts to those of us that are still interested in establishing what really happened that night. I am sorry to be bringing up a topic that is only tangentially related to the current one, but I thought you would want to know that many of us out there are taking the CBS testimony with a grain of salt, and are concerned about the damage it could do to the Egyptian revolution if it is false. By the way, you have some amazing photos on your blog – I enjoyed looking at them. I didn’t know that map, it’s cool. There was a banner right below the “W” of wall. That’s where the meret Basha ave. begins and it goes to the 6th of October bridge, passing next to the E. Museum. We had a tent on that street, roughly about 100 metres away from the museum and 150 from the banner. Let’s say by the camera logo of “tanks”. The tea vendor was about 25 metres away from the tent on the way to the banner. Oh, and about the time. I can’t tell exactly what time it was. It was a long night, full of excitement and incidents. It probably was past midnight, but I didn’t check the exact time. I certainly don’t expect you to agree with the analysis since, if true, it would contradict the testimony of some of your witnesses. To the contrary, since you were camped out very close to where this incident took place, it occurred to me that you might know what it was all about and be able to provide an explanation. If my analysis is wrong, then that’s fine – I am just interested in the truth on the Lara Logan issue, whatever that is. Honestly, I’m not interested on this matter anymore, I’m bored. Since you’ve put so much effort on it, though, I read your posts and examined each of your pictures. – There’s nothing we can get from these images. You are right to warn us several times that “if” this is Logan, then it’d be as you’re telling us. But telling that that blurry spot is Logan covered by an Egyptian flag, that one is Logan with torn fabric hanging from her waistband that looks like black pants, that one is a woman with a burka and that one a soldier in riot gear, seems to me an act of divination. It’s all darkness and blur. – You are assuming a soldier (not twenty soldiers?) went there in riot gear. But I never saw soldiers in riot gear. Do you know anyone who has? The photo of Egyptians in riot gear is police. Also, it’d be the first time ever that someone in riot gear is acting alone. And he would be immediately stripped off it: stolen riot gear collection is a fancy hobby among Egyptian protesters as anywhere else in the world. – There’s no bottleneck where you think there is. That picture makes it look like that. But the place where we were at is an avenue split in two by a long median strip, which in fact creates two spaces, as if it was two different straight streets. Logan and this people came on the one nearer to the Museum and Metro entrance. I appreciate your efforts, my friend. But there are other things that seem more important to me right now. She’s a liar and the damage is done. But I don’t care about that. I care about those who live under a repressive, violent regime, and who are in danger. I’m hoping to go back to Egypt soon. Perhaps your skills would be more useful finding out truth behind the dictatorships’ lies? I salute you. Un abrazo! Here’s a video of an Egyptian mob assaulting on another female reporter in Tahir Square. There is definitely a pattern. The problem has as much to do with denial as with sexual harassment. That’s right, there is a pattern of assaults against journalists which may turn sexual in cases of females. It happened several times during the Tahrir camp days and it’s probably been happening to local reporters for a while, but it came to international attention just when foreign ones started being attacked. What makes the “virginity test” cases particularly alarming is that they weren’t sexual assaults performed by chaotic mobs, but by the army, under specific orders and peaceful conditions, in a cold and organised way. That’s State-sponsored terrorism against its female citizens. Thanks for reading my post and replying to it. We are all looking forward to your reports from Egypt when you go back there. Good luck!